1. Expanded previews for two games: a matchup of aces in Boston, and a West Coast rivalry game featuring two solid young pitchers. 2. Additionally, find enclosed brief previews for three other, only slightly less titillating tilts: Atlanta at Arizona, Chicago (AL) at Cleveland, and Milwaukee at San Diego. 3. Pitcher and Team NERD scores for every one of tonight’s games. • Justin Verlander has a .209 BABIP, but that tends to be the case when, you know, a pitcher goes a whole game without giving up any hits at all. 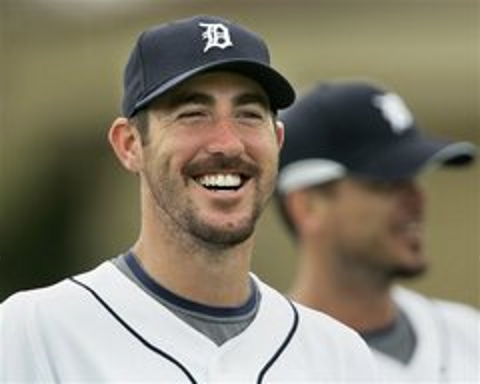 • Justin Verlander also probably won’t have too many more games where he doesn’t, you know, give up any hits at all. • Either way, though, he’ll probably end up with more of those games than his counterpart, Josh Beckett. • And since Josh Beckett doesn’t have a no-hitter, I totally can’t justify his .220 BABIP. • Which means that Beckett is totally due to be really bad. Just watch. • Pitcher quality would be directly related with facial hair quality. Which would be a very, very bad thing for a certain probable starter for a certain team from Boston. • I would be just as good a Major League pitcher as I am now. • Chad Billingsley has a pitch type value of 25.75 for his slider. Sure, he’s only thrown it 0.1% of the time according to BIS and it probably was just a misclassified cutter. But dang, that’s a good pitch. • Only a team with Clayton Kershaw can make a pitcher on pace for his third straight four-win season in four years look pedestrian. • Wait, actually, a team with Tim Lincecum would probably be pretty good at that, too. • Because even if 4.25 Madison Bumgarner’s ERA comes down toward his 3.07 FIP and 3.35 xFIP, he still won’t be Tim Lincecum. • But Madison, I can relate. I also have to deal with not being Tim Lincecum on a daily basis, and it’s terrible. • I would be Tim Lincecum. • I would also settle for being Clayton Kershaw. • At the very least, they would be starting this game. • Josh Collmenter has a 5 NERD score, but that’s just by default. There’s no way this guy is only a 5 on the NERD scale. • Back when Fausto Carmona was good, he was getting over 60% ground balls. This year, he’s getting 60% ground balls. And hey, he’s good again (3.94 ERA, 3.95 FIP)! • The name Prince Fielder really doesn’t fit him at all. He’s actually not even a member of any royal family. These games are very likely playing at some kind of sporty channel near you. We hoped you liked reading One Night Only: Hot Game Previews For 5/19 by Jack Moore! Casey Coleman has a 0 NERD score? That is totally not surprising.